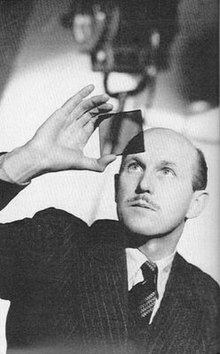 Michael Latham Powell (30 September 1905 – 19 February 1990) was an English film director, celebrated for his partnership with Emeric Pressburger. Through their production company "The Archers", they together wrote, produced and directed a series of classic British films, notably 49th Parallel (1941), The Life and Death of Colonel Blimp (1943), A Matter of Life and Death (1946, also called Stairway to Heaven), Black Narcissus (1947), The Red Shoes (1948), and The Tales of Hoffmann (1951). His later controversial 1960 film Peeping Tom, while today considered a classic, and a contender as the first "slasher", was so vilified on first release that his career was seriously damaged. 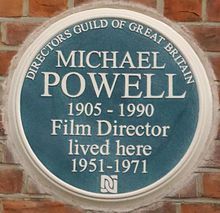 Powell entered the film industry in 1925 through working with director Rex Ingram at the Victorine Studios in Nice, France (the contact with Ingram was made through Powell's father, who owned a hotel in Nice). He first started out as a general studio hand, the proverbial "gofer": sweeping the floor, making coffee, fetching and carrying. Soon he progressed to other work such as stills photography, writing titles (for the silent films) and many other jobs including a few acting roles, usually as comic characters. Powell made his film début as a "comic English tourist" in The Magician (1926). After scriptwriting on two productions, Powell entered into a partnership with American producer Jerry Jackson in 1931 to make "quota quickies", hour-long films needed to satisfy a legal requirement that British cinemas screen a certain quota of British films. During this period, he developed his directing skills, sometimes making up to seven films a year. In 1937 Powell completed his first truly personal project, The Edge of the World. Powell gathered together a cast and crew who were willing to take part in an expedition to what was then a very isolated part of the UK. They had to stay there for quite a few months and finished up with a film which not only told the story he wanted but also captured the raw natural beauty of the location. "Emeric produced a very small piece of rolled-up paper, and addressed the meeting. I listened spellbound. Since talkies took over the movies, I had worked with some good writers, but I had never met anything like this. In the silent days, the top [American] screenwriters were technicians rather than dramatists ... the European cinema remained highly literate and each country, conscious of its separate culture and literature, strove to outdo the other. All this was changed by the talkies. America, with its enormous wealth and enthusiasm and it technical resources, waved the big stick. ... The European film no longer existed. ... Only the great German film business was prepared to fight the American monopoly, and Dr. Goebbels soon put a stop to that in 1933. But the day that Emeric walked out of his flat, leaving the key in the door to save the storm-troopers the trouble of breaking it down, was the worst day's work that the clever doctor ever did for his country's reputation, as he was soon to find out. As I said, I listened spellbound to this small Hungarian wizard, as Emeric unfolded his notes, until they were at least six inches long. He had stood Storer Clouston's plot on its head and completely restructured the film." 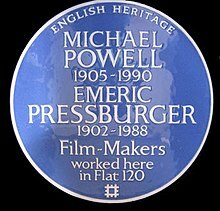 The Academy Film Archive has preserved A Matter of Life and Death and The Life and Death of Colonel Blimp by Michael Powell and Emeric Pressburger. The Man Behind the Mask Joe Rock Studios reissued as Behind the Mask. Only exists as a cut-down US print. ↑ "Features: The BFI 100." Archived 1 July 2008 at the Wayback Machine BFI, 19 February 2008. Retrieved: 28 September 2009. ↑ "Awards History." edfilmfest.org.uk. Retrieved: 7 December 2017.